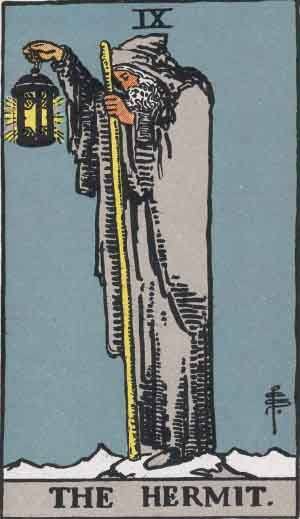 The Hermit is the ninth Major Arcana card. It’s one of the more well known cards and has been used frequently in popular culture. The Hermit has an easily identifiable meaning; loneliness, introspection, wisdom, but also further meanings can be drawn; hermeticism, mysticism and realisation. The Hermit represents Introspection, Solitude and Retreat. Past – The Hermit in the Past position represents prior solitude and rest after a long journey. You might have learned a big life lesson recently and you need time alone now to reflect. Spending time to ourselves is good, even if this isn’t what we want. Sometimes we desire friendship, companionship and relationships. Surviving through times of loneliness makes us stronger and more interesting as people. You have time to become yourself, and not be influenced by others. Present – The Hermit in the present position means you’ve got to look within for answers. You know all you need, you just need to contemplate for a short amount of time. Like an ancient astronomer trying to work out the fabric of the universe; you have all the tools you need, you just need to work on your own thoughts and perception. Many great discoveries were made by people on their own, through the lack of distraction in their lives, they were able to concentrate fully on their tasks. Future – The Hermit in the future position means one of two things. You could have thought about what is troubling you for long enough to make a realisation and go on with your life, or you might be reaching this point very soon. Work / Education – The Hermit in regards to work or education means you need to hunker down and get on with it. You’ve learnt the theory, now is time to put it into practice. Look to work on your own in the near future, if the option allows. Romance – The Hermit is not a good card in regards to romance. It might not be the right time to pursue any romantic relationships right now. If you are in a relationship, consider spending a bit more time apart than usual. The Hermit is not a great sign when it comes to love, so try not to pursue anything, but remember that this time will pass. Friends – The Hermit in regards to friendship means much the same as romance. Working with like-minded people on a similar wavelength will always be good. Remind yourself not to push yourself to socialise if you do not feel the need to. Money – The Hermit in regards to wealth means that things will be much the same now as the near future. You have bigger things to worry about than finances. Health – The Hermit could mean a few things in regards to health. If something is worrying you, and has for ages, be careful not to act like a hermit and not mention it to anybody. This could be a physical or mental problem you’re having. Talk about it and get a second opinion from somebody you trust. In reverse, consider your actions. You may feel you wish to be alone, but think if this might hurt somebody else. Sometimes we desire solitude when it is not needed. Do not run away from your problems. Too much solitude can be a problem too. We exist as social creatures, and to spend too much time alone can be very damaging. We’ve selected live tarot readers to give you a FREE 3 Minute interpretation of The Hermit! Scroll through them below and pick your favorite one.